Meet Megg. Old school charm with a stylish edge. Inspired by antiquity, Megg will bring classy elegance to your home. Run your hands through the carved detailing of dark polished wood. Fill up its roomy space with all of your bits and bobs. Finished with sturdy metallic legs that elevates this classic design to the next level. Designed with Acacia wood, the material embodies strength and beauty in one. 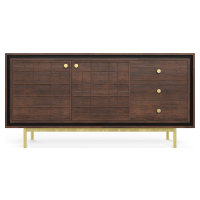 Whether you need a sideboard, entertainment unit, or a bar cabinet, Megg has you covered on all of the essentials.